Are you wondering how to store seeds? I’ve been using a photo box for several years now and think it makes the best garden seed organizer ever! Take control of your seeds using this cool box! 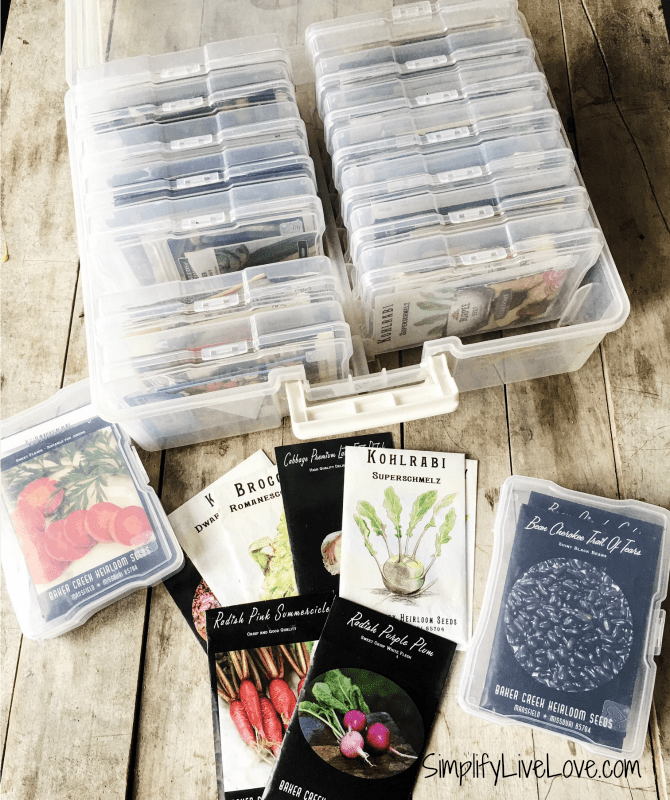 For years I had a haphazard garden seed organizing system which amounted to shoving seed packets in a shoebox or a ziplock baggie (or both) and putting them in a “safe spot” I was sure to forget about. Sound familiar at all? If you’re like I was, I highly recommend upgrading to this awesome photo box I got on Amazon. I think it’s a real bargain at under $20. I try to keep like seeds in one box. For instance, tomato seeds are in one box. Pepper seeds in another, flowers, herbs, zucchini, corn, etc. Believe it or not, all 16 of my boxes are full. Sometimes I even keep empty packets in the boxes so I can go through them in the winter and decide what to order again. My only caveat is that you have to close each envelope tightly or the seeds will fall out. That’s not necessarily a huge problem unless you have a lot of different types of seed packets open in each box. It’s pretty hard to tell one broccoli seed from a kale or cabbage seed! Garden Seed Storage Made Easy! All in all, I love this seed saving box. It’s easy to use, handy to store, and quick to find. It makes ordering new seeds a snap and keeps all my pretty little lovelies safe and sound. If you’d like to order one too, head on over to Amazon. You can order a box with a purple handle for under $20, or get the white handled box for $30. I’d personally save $10 and order more seeds. 🙂 If you have an absolute ton of seeds, you can also get two large white boxes for $35. Make sure to keep the box in a cool, dark place to give your seeds the longest life. Happy Organizing! What’s your favorite way to store garden seeds? I’d love to know! I love this idea. I have been looking for something that would keep my seeds organized. I love your idea. I have that same problem with kale vs broccoli vs turnips. The seeds all look alike! Thanks, Anna! I love my little seed box. This is a great idea, thank you so much for sharing it. I'm going to need a couple of these to keep all my seeds organized; veggies in one, flowers in another...It's only a matter of time before I organize into planting times! Love it! I think I saw these at a craft store recently, I never thought to use it for seeds! I'll have to get one - thank you! Do you still use this method of storage? I'd love to know! Upate: purple handle is now $28.99 on AZ.